The major events that will headline tomorrow's news are already pre-recorded. About one third of the Bible is prophecy, and most prophetic passages apply NOW — to our time — the world in which we live. Yet Biblical prophecy is a complete mystery to millions. Why? Because certain vital keys are not understood. They have become lost. It is now God's time to reveal these most important keys to Biblical understanding. Read of them in this timely booklet and really begin to understand Bible prophecy. BIBLICAL prophecy has perplexed millions! Many hundreds of volumes have been written — articles, leaf lets, tracts printed — thousands of sermons have been preached — all about Biblical prophecy! Many believe ALL the prophecies were merely the pronouncements of wild-eyed fanatics carried away with visions of doom. Still others believe the prophecies are confined to the Old Testament, and are all done away. The Hebrew word for prophet, naui, means "one who announces or brings a message from God." The word "prophet" in the English language means essentially the same thing — "one who speaks by divine inspiration as the interpreter or spokesman of God," whether it be a message of duty and warning, or a prediction of future events. A prophet is one who speaks for God; hence, the prefix pro (from the Greek language — from which our word prophet is derived) which means "for" and "before." So that a prophet is one who speaks for God, or one who tells before — one who predicts, foretells, prophesies. Many people falsely assume all prophecies are dire foretellings of catastrophic events, of the wrathful vengeance of a harsh God who is about to descend with terrible fury upon His hapless subjects here below! Many prophecies foretell, in advance, certain events which are to happen, the rise and fall of nations, the course of world affairs! Prophecy is a chronicle of the great PLAN God is working out here below! It describes this plan in detail, showing how God knows it will work out, according to human nature, together with other special interventions of God. To most professing Christians the writings of men like Daniel Zechariah, Joel and John (in Revelation) are shrouded in mysterious symbolism and meaningless metaphor. So complete is this blindness that some "higher critics" have even dared to propose that such prophetic writings are merely the rantings of drug-driven hallucinators of antiquity. But here is the true story of these men of God. The prophets were not a special hierarchy, a guild, or a certain "class" of men! Many of them were chosen from various of the twelve tribes of Israel, and, unlike those of the tribe of Levi, were not born into their office. They were princes, sheepherders, farmers, fishermen, and priests. They came from many different tribes, and God called them at many different times. Jeremiah was one "of the priests" (Jer. 1:1), who argued that he was too young to become a prophet of God! Jonah ran from the call of God, Isaiah claimed he was a man of unclean lips and didn't want to prophesy, and Zephaniah was one of the princes of Judah, possibly of the descendants of Hezekiah. "The words of Amos, who was among the herdmen of Tekoa, which he saw..." (Amos 1:1).Amos was going about his daily life, among the herdsmen, minding his own business, and God expressly REVEALED a certain message to him. Later, when Amos was approached by Amaziah, the priest of Bethel, who told Amos not to prophesy, but to go into another country, Amos answered, "...I was no prophet, neither was I a prophet's son; but I was an herdman, and a gatherer of sycomore fruit [margin — wild figs]: and the LORD [Eternal] took me as I followed the flock, and the Eternal said unto me, Go prophesy unto my people Israel" (Amos 7:14-15). Amos was herding sheep — NOT "looking" for some kind of religious "experience" — and GOD CALLED him. As the Holy Spirit inspired Peter to write, God called His prophets — sent them as divinely commissioned messengers. "...The prophecy came not in old time by the will of man: but holy men of God spake as they were moved by the Holy Ghost [Spirit]" (II Peter 1:21). Many had to be made willing to carry the message of God. These men WERE NOT SEEKING some kind of "spiritual experience," they were not earnestly desiring the office of a "prophet." They were chosen of God! And on these men, together with the New Testament apostles, is based the very Church of God! "Now therefore ye are no more strangers and foreigners, but fellow-citizens with the saints, and of the household of God; and are built upon the foundation of the apostles and PROPHETS, Jesus Christ himself being the chief cornerstone" (Eph. 2:19-20). God inspired his Prophet Amos to tell us, "The Lord Eternal never does anything without telling his servants the prophets" (Amos 3:7, Moffatt translation). Before God intervenes in the affairs of a nation, or the world, He first sends His servants to warn those who will be directly affected by what He intends to do. Why does He do this? To give them a chance to CHANGE their ways — to REPENT of their sins — so that the prophesied calamity need not come to pass. God is absolutely fair, just and righteous. He sends a WARNING, and gives people a chance to repent. The purpose of prophecy, therefore, is threefold. First, it is given in love to encourage people to repent of their sins so they can escape punishment. Second, it is given for those who don't repent at first, so that when their punishment comes, they will then acknowledge their sins and repent toward the God who will then deliver and rescue them! (Deut. 4:25-31.) Third, it announces in advance the coming Kingdom of God, the wonderful world tomorrow — a time of the restoration of this earth to a condition of prosperity, peace and abundant well-being. God selected Jonah as a prophet and, after making him willing to carry the message of God, commissioned him to go to the great city of Nineveh. Jonah finally went. Jonah prophesied, lifting up his voice in loud warning as he traversed the great, sprawling city of Nineveh. Finally the word came to the king realized the seriousness of the prophecy, and "...arose from his throne, and he laid his robe from him, and covered him with sackcloth, and sat in ashes. And he caused it to be proclaimed and published through Nineveh by the decree of the king and his nobles, saying, Let neither man nor flock, taste any thing: let them not feed, nor drink water: But let man and beast be covered with sackcloth, and cry mightily unto God.... And God saw their works, that they turned from their evil way; and God repented of the evil, that he had said that he would do unto them; and he did it not" (Jonah 3:6-10). Notice the 36th chapter of Jeremiah. "And it came to pass in the fourth year of Jehoiakim the son of Josiah king of Judah, that this word came unto Jeremiah from the Eternal, saying, Take thee a roll of a book [scroll], and write therein all the words that I have spoken unto thee against Israel, and against Judah, and against all the nations....It may be that the house of Judah will hear all the evil which I purpose to do unto them; that they may return every man from his evil way .... Then Jeremiah called Baruch the son of Neriah: and Baruch wrote from the mouth of Jeremiah all the words of the Eternal, which he had spoken unto him, upon a roll of a book" (Jer.36:1-4). After the writing of this dire warning toward ancient Israel and Judah, notice what happened: "Jeremiah commanded Baruch, saying, I am shut up; I cannot go into the house of the Lord: therefore go thou, and READ in the roll, which thou hast written from my mouth, the words of the Eternal in the ears of the people in the Eternal's house upon the fasting day....It may be they will present their supplication before the Eternal, and will return every one from his evil way. . .. And Baruch the son of Neriah did according to all that Jeremiah the prophet commanded him, reading in the book the words of the Eternal in the Eternal's house" (Jer.36:5-8). The people heard it, and also one of the princes who was present. He carried the message to other princes, whereupon they sent Jehudi (verse 14) to tell Baruch to come to them. He arose, took the scroll in his hand and began to read it to them. They then told the king (verse 20). Now notice what happened! "So the king sent Jehudi to fetch the roll: and he took it out of Elishama the scribe's chamber. And Jehudi read it in the ears of the king, and in the ears of all the princes which stood beside the king. Now the king sat in the winter house in the ninth month: and there was a fire on the hearth burning before him. And it came to p ,that when Jehudi had read three or four leaves [columns], he [the king] cut it with the pen knife, and cast it into the fire that was on the hearth, until all the roll was consumed in the fire that was on the hearth" (verses 21-23). The king then commanded (verse 26) that Baruch and Jeremiah be seized. However, they escaped, being hidden of God. But — IF the whole purpose of this prophecy had al ready been fulfilled — if there were not yet a FUTURE fulfillment of this prophecy — THEN WHY DID GOD CAUSE EVERY WORD TO BE WRITTEN THE SECOND TIME? "Then the word of the Eternal came to Jeremiah, AFTER that the king had burned the roll, and the words which Baruch wrote at the mouth of Jeremiah, saying, Take thee again another roll, and write in it ALL THE FORMER WORDS that were in the first roll, which Jehoiakim the king of Judah hath burned" (Jer. 36:27-28). Do you see? God caused every single word, and other words besides, to be WRITTEN the second time. Also, He caused Jonah to write the prophecy even though the city repented. God wanted these words preserved! God wanted them to come right on down to our time — now! You will begin to see why as you continue reading. Here's part of the reason: "Now these things were our examples, to the intent we should not lust after evil things, as they also lusted" (I Cor. 10:6). God caused the prophecies to be written for our examples, today! "Now all these things happened unto them for ensamples: and they are WRITTEN for our admonition, upon whom the ends of the world are come (I Cor. 10:11). And "For whatsoever things were written aforetime were written for our learning, that we through patience and comfort of the scriptures might have hope" (Romans 15:4). God caused the prophecies to be written to SHOW His servants how world conditions would work out. "The Revelation of Jesus Christ, which God him, to shew unto his servants things which must shortly come to pass; and he sent signified it by his angel unto his servant John" (Rev. 1:1). And, as we said before, God says He will NOT cause any major world condition to occur, that He will not intervene in world affairs, unless His servants — those who are members of the very body of Jesus Christ — know about it first! "Surely the Eternal God will do nothing, but he REVEALETH his secret unto his servants the prophets" (Amos 3:7). Ezekiel then heard a voice (chapter 1:28) and the voice said, "Son of man, stand upon thy feet, and I will speak unto thee.... And he said unto me, Son of man.. .I do send thee unto them; and thou shalt say unto them, THUS SAITH THE LORD GOD" (Ezek. 2:1,3,4). The Prophet Ezekiel was given a message by the Eternal God. He was sent to the House of Israel! He was also given prophecies against the Ammonites (25:2), against Moab (25:8), against Edom (25:12), against the Philistines (25:15), against Tyre (26:2-3), against Egypt (29:2), and against other nations, a great distance from his location in Babylon. But Ezekiel was in captivity. Yet the word of the Eternal came to him, giving him these messages — commissioning him to warn these specific nations! Imagine it! Picture, if you can, a young Jewish lad in a concentration camp in Germany, during World War 11. Let's suppose Almighty God reveals to him startling visions, symbolizing what is to happen in Egypt, Japan, Great Britain and the United States! God tells him to "get you into Egypt, Japan, Britain and the United States." Do you realize that Ezekiel, a young captive Jewish lad, in a veritable "concentration camp" in Babylon, was given prophecies toward Israel over 120 years after Israel had already gone into a captivity? And that he never reached the ancient Israelites with the message? Ezekiel saw visions of impending destruction upon Israel "in the fifth day of the month, which was the fifth year of king Jehoiachin's captivity" (Ezek. 1:2-3). Jehoiachin went into captivity in 596 B. C. The fifth year brings us to about 592 B.C., or over 125 years after the removal of the last of the remaining northern tribes, 721-718 B.C. But more about the dating of the book of Ezekiel later in this booklet. If you have not yet seen the startling identity of the lost ten tribes of Israel PROVED, read our FREE, full-color book The United States and British Commonwealth in Prophecy. Ezekiel's prophecy, never, in all history, until NOW, reached the ears of the nations, peoples or kings for whom the messages were intended. Rather, Ezekiel WROTE these amazing prophecies! He wrote them because God was intending to PRESERVE THEM for our day! Prophecy is DUAL! Notice the theme of duality running throughout the Bible. There was the first man Adam, and the second Adam, who was Christ (I Cor. 15:45-47). There is the Old Testament, and the New Testament. There was the old Jerusalem and a new heavenly Jerusalem. Study Matthew 24! Here, Jesus answered the questions of the disciples about the end of the age, and His imminent return! Many believe Matthew 24 was totally FULFILLED in 70 A.D. at the destruction of Jerusalem. This is entirely baseless! They must believe, by this assumption, that Jesus was a liar! But Christ did not lie. What happened in part in 70 A.D. was merely a forerunner, a of the REAL FULFILLMENT of ALL the prophecies of Matthew 24! Ezekiel's prophecies are also DUAL! And the real, LITERAL fulfillment of the prophecies of Ezekiel is right ahead of us NOW! Another crucial aspect of the prophetic time factor is what we shall call prophetic time lapses. This very factor has been a major stumbling block to many students of prophecy. Even learned commentators have failed to grasp the principle of prophetic time lapses. This is especially true in Isaiah, Daniel and Revelation. Notice it in Luke 4:16-20:"And he came to Nazareth, where he had been brought up: and, as his custom was, he went into the synagogue on the Sabbath day, and stood up for to read. And there was delivered unto him the book of the prophet Esaias [Greek for Isaiah]. And when he had opened the book, he found the place where it is written, The spirit of the Lord is upon me, because he hath anointed me to preach the gospel to the poor: he ha me to heal the brokenhearted, to preach deliverance to the captives and the recovering of sight to the blind, to set at liberty them that are bruised, to preach the acceptable year of the Lord. AND HE CLOSED THE BOOK...."
The remainder of the prophecy — starting in mid-verse — applies to Christ's second coming — that time known as "the day of the Lord" — or as Isaiah expressed it, "AND THE DAY OF VENGEANCE of our God...."
In other words, we see in one verse of Bible prophecy a prophetic tine lapse of almost 2000 years between the fulfillment of the first and second parts of that one verse. In Revelation 12 we find a brief biography of the devil from his initial rebellion many millennia the years and months just ahead! And all in 7 short verses! But understanding time factors alone is not enough. We must add to this a knowledge of God's use of symbolism. To grasp prophetic meanings God often uses symbols, analogies, metaphors and allegories in describing future events. It is critical to understand when such de vices are being used and when a word is to be taken liter ally! Many have gone astray because they have failed to grasp the symbolic meaning of a word as opposed to a literal application. Thus we find a principle of prophetic understanding. When a word is obviously used as a symbol, we must look elsewhere in the Bible for the interpretation or meaning of that symbol. The symbol for an angel is often a "star." God uses many symbols when describing prophetic events. In Revelation 17 we find two mysterious symbols used in portraying events which are not too far in the future. In verse one we read, "...I will shew unto you the judgment of the great whore that sitteth upon many waters." Here we must know the meaning of "many waters" and just who this "whore" is if we are to understand the prophecy. Verse 18 of the same chapter gives us the answer in part. "And the woman [whore] which thou sawest IS THAT GREAT CITY, which reigneth over the kings of the earth." Therefore, we understand that the woman, or whore, as GOD calls her, represents a city-centered entity which has influence over kings — that, in fact, has ruled and will rule over other rulers! Verse 15 tells us what the "waters" represent. "...The waters which thou sawest, where the whore sitteth, are PEOPLES, and multitudes, and NATIONS, and tongues." But to really understand the symbolism of the "woman" in this chapter, we need additional information. We find that throughout the Bible a woman often is used to signify a CHURCH. The congregation of Israel was called the "church in the wilderness' according to Acts 7:38. And in describing how God brought Israel out of Egypt and made them a great nation, the Bible uses the analogy of a female baby growing up to womanhood in Ezekiel 16. Notice the phraseology. "...Thus saith the Lord God unto Jerusalem [representative of the whole nation of Israel] ...thou didst trust in thine own beauty, and played the harlot...and madest to thyself images of men, and didst commit whoredom with them.. .thou hast taken thy sons and daughters, whom thou hast borne unto me.... How weak is thine heart.. .seeing that thou doest... the work of an imperious whorish WOMAN" (Ezek. 16:3, 15, 17, 20, 30). Therefore, we see the "church in the wilderness" — ancient Israel — was represented by a woman who became an adulterous wife to God. In the New Testament the true and false churches are also represented as women. In Ephesians 5:22-32, Paul draws a parallel between the husband-wife relationship and Christ's relationship to the Church. Revelation 19 speaks of the "marriage of the Lamb," and the Church is represented as the bride of Christ. The true Church is called "Jerusalem which is above. . . which is the mother of us all" in Galatians 4:26. Also the Apostle Paul, in writing to the Church at Corinth, says, "... I am jealous over you with a godly jealousy: for I have espoused you to one husband, that I may present you as a chaste virgin to Christ" (II Cor. 11:2). The principle is consistent. Biblical symbolism often depicts a church as a woman. When we understand the symbolism, then we can see that Revelation 17 is talking about a religious entity based in a great city, which exercises influence over human kingdoms and nations which speak various languages! The horrifying weaponry of modern warfare! The Apostle John, seeing such machinery of death in vision some 2000 years ago, could only liken it to destructive and harmful insects of his day. He used the symbolism of scorpions and locusts to describe end-time armies and their weaponry. round earth? Obviously, the term "mountain" is used sybolically here. Daniel has just been recounting Nebuchadnezzar's dream. The entire dream was based on symbols. Go back and read verses 31-35 to get the whole picture. Then God explains the terminology used in the preceding verses in verses 36-45. Note especially verse 44, which explains what the "mountain" that fills the whole earth is: "And in the days of these kings shell the God of heaven set up a kingdom, which shell never be destroyed: and the kingdom shall not be left to other people, but it shall break in pieces and consume all these kingdoms, and it shall stand forever." Now the meaning becomes clear! God was showing the world's kingdoms by means of the images. The various parts of the image represent various world-ruling kingdoms, namely the Babylonian (which Nebuchadnezzar ruled over), the Medo-Persian (which followed it), the Greek and finally the Roman. Then the "stone" which grew into a "mountain" destroys the last of these kingdoms, which is the final "resurrection," or revival, of the end-time Roman Empire. Christ will return and set up His Kingdom, which will be a WORLD-RULING Kingdom that will endure forever! That is what is pictured by the "mountain" that fills the whole earth. In Revelation 9 we find still more mysterious symbolism. In verse one we again find the star symbol used for an angel. Here the "star" is personified and performs a certain duty for God. "...And I saw a star fall from heaven.. .and to him was given the key of the bottomless pit." Of course, there is no such thing as a "bottomless pit." This is an unfortunate translation. It should more correctly be rendered "the abyssal shaft," or "abyss," as has been done by other translators. It should be apparent that John is not describing literal locusts! Whatever he is describing seems to be con trolled by men (verse 7). Interestingly enough, these locusts (or the men) have long hair as women (verse 8). It becomes apparent that what John is seeing is modern military weaponry at its hideous worst! Today's frightening array of weaponry would give pause to the bravest man of our time, much more of John's time! And how else could the apostle describe it? There were no jet planes or rocket-launching helicopters in his day. The heart-stop ping roar of hundreds of jet fighters and bombers was un known at that time. To see men at the controls of such instruments of destruction would have been a shattering experience for any first-century ex-fisherman! Who in John's time could have envisioned laser beams and flame throwing tanks? Could any have foreseen the advent of giant Polaris missiles being emitted from the bowels of a nuclear-powered, undersea monster called a "submarine"? And what about the weapons John saw that we don't know of yet? Perhaps even more terrifying weapons are on the drawing boards? Even if God had inspired John to write in modern military shoptalk, who would have understood any of it be fore the latter part of this modern age of space travel? John had to use the language of his day. Thus, the symbolism of great flying locusts. In verse 11 we find the motivating force behind this great military power described. "And they had a king over them, which is the angel of the bottomless pit [abyss], whose name in the Hebrew tongue is Abaddon, but in the Greek tongue hath his name Apollyon [Destroyer!]." This fallen angel or demon is none other than Satan the devil — the Destroyer. He is the old serpent of Revelation 12:9, who is called the "god of this world" in II Corinthians 4:4. He is the same one who gives his power to a great end time false prophet (II Thes. 2:7-9). He will stir up certain kings or rulers to amalgamate their military forces to be come the greatest war-making machine in history! We have explained several Biblical principles concerning prophecy: duality, prophetic time lapses, symbolism. Now we propose to explain logical systems that you can use to evaluate Biblical prophecy. Actually, we must present two such logical systems — one for the analysis of Bible prophecies already fulfilled in the past and the other for the analysis of Bible prophecies yet to be fulfilled in the future. 1)Read the prophecies in the Bible. 3) Prove that the prophecies were written in the Bible long before the historic fulfillments. Look at the procedure again. We can give you a start. There are certain key chapters with which you should be familiar: Daniel 8 and 11 for the astoundingly accurate ancient history of the Persian, Grecian and Roman empires; Isaiah 53 for the in-advance setting forth of the purpose of the Messiah's physical life. Second, read the actual historical occurrences — the fulfillment — as they were originally recorded by un biased, independent, secular sources. Prove just how accurate Daniel 8 and 11 and Isaiah 53 really were. An easy place to begin your historical search would be a good Bible commentary, for example, the one by Jamie son, Fausett and Brown. But go further. Check some authoritative history books. George Rawlinson's Manual of Ancient History, for example, is excellent for showing the historical fulfillment of Daniel 11. We are sure that you will find an incredibly precise correlation between the clear statements of prophecy and the actual historical events. Even Bible critics admit this. In fact, as odd as it sounds, "fulfilled prophecy" is the underlying motivation for their criticism. Because if — and here is our third and final point — the prophecies of the Bible were indeed written before the historical event had occurred, then it would be embarrassingly obvious that no man could have made them up. A Supernatural Being — a Great God to be blunt — must have been involved. This is not a very desirable conclusion for certain individuals. And so the advent of Biblical criticism. Here was a method by which self-appointed critics sought to demonstrate that Bible prophecies were in fact written after the events had occurred. They hoped to prove that what "appeared" to be spectacular prophecy was merely ordinary history. Or, more accurately, history written in a "prophetic style." So the whole issue of Bible prophecy — indeed the whole issue of the divine inspiration and validity of the en tire Bible — focuses in on this one point: Were the prophecies of Isaiah, Ezekiel and Daniel, for example, forgeries, written after the historical events described — as some few Bible critics claim? Or can we believe the dates undeniably stamped by the Bible itself? For the sake of brevity, we will only cite the book of Ezekiel as an example. Now that's evidence! Yet some critics just toss aside such careful, meticulous dating! The answer is twofold. First they must assume — without proof — that Ezekiel's prophecies are not of divine origin. Then, proceeding from this assumption, they reason that Ezekiel had to have had certain historical information available before he could have written these remarkable "histories." Now let's consider the problem that this imaginary, "pseudo-Ezekiel" would face in getting his spurious book accepted as the work of an original Ezekiel and then have it accepted as Scripture. During the time of the Babylonian captivity there was a recognized religious authority among the Jewish people. Ezekiel refers to them as the "elders of Judah" (Ezek. 8:1). Later, when Cyrus decided to give permission for the Temple to be rebuilt, "Then rose up the chief of the fathers of Judah and Benjamin, and the priests, and the Levites ...to go up to build the house of the Lord which is in Jerusalem" (Ezra 15).The leaders of this expedition were Zerubbabel the governor and Joshua the high priest. A little later, about 457 B.C., Ezra comes to the Holy Land. Ezra is called "a ready scribe in the law of Moses, which the Lord God of Israel had given" (Ezra 7:6). "Ezra had prepared his heart to seek the law of the Lord, and to do it, and to teach in Israel statutes and judgments" (verse 10). Notice that Ezra was not a lawgiver, but a scribe — a copier — of an already existing code of law. Throughout Ezra and Nehemiah, it is quite obvious that there is a ruling body of Jews concerned with ecclesiastical affairs and that there is a "holy scripture" — an authoritative body of religious writings (see Neh. 8:1). There can be no question that this "law of Moses" was the Torah — the first five books of your Old Testament. Remember this was before 400 B.C. Now back to the mischievous plot of "pseudo-Ezekiel." He would have had the rather formidable task of palming off on a group of Jewish priests, Levites, and governors, a totally new book which none of them had ever heard of before — and convince them that it was written during the Babylonian captivity. Quite an assignment! The Jewish people have always been an intelligent, practical people with a great deal of common sense. Would they have accepted a book purporting to have foretold, in advance, the history of the last few years, yet which did not appear until after the event? Suppose some individual would try to convince you that he has found a book listing in detail all the major events of 1967-1969 — and that the book was published in 1944! Would you immediately accept this would-be prophet? Wouldn't it seem just a little bit contrived? When one comprehends the exalted position of the Torah among the Jewish people past and present, the obstacles that a "pseudo-Ezekiel" would face become absolutely insurmountable. Why then were Ezra and the men of the Great Synagogue (the assemblage of priests and Levites constituting the religious authority) willing to accept the real Ezekiel at all? The answer becomes obvious when we understand that the Canon of the Old Testament — that is, the books making up the Old Testament — was complete by the end of the fifth century B.C. Ezra and the Jews with him in Babylon were aware of the prophetic work of Ezekiel when they returned. Ezekiel had been part of the succession of prophets: He had held an office which was honored and respected. A few of his prophecies had already begun to come to pass. And these prophecies continued to be fulfilled before the Jews' very eyes — while the book was in their very possession. Nobody could question the authenticity of the book. Finally, since both Jewish tradition and the Jewish historian Josephus state that the Old Testament was completed about the end of the fifth century B.C., there can be no question of a later date for Ezekiel. Absolutely the only claim that can be seriously advanced to question Ezekiel's own date is the fact that NO MAN could have made the prophecies that Ezekiel made. This, however, is not evidence for a later date. It is PROOF OF A DIVINE ORIGIN! Remember, ONLY God's true servants have come to properly understand prophecy. Others try — by the thou sands of hours of preaching and by the tons of printed material. But all for nothing. God's true disciples in this age will be shown "the things to come" by God's Holy Spirit (John 16:13) — given to them because they believe in, preach and obey God (Acts 5:32). These individuals have a "good understanding" because they keep God's Commandments to DO them (Psalm 111:10; Rev. 22:7, 14). Wherever you can find a "Work of God" that fulfills these conditions — which keeps God's Commandments — there you will also find God revealing His secrets — which means opening up Bible prophecies for the practical understanding of future events. Second, in order to enable these ancient and divine prophecies to be opened, we do in fact need certain "keys." We must know about whom and to whom the many prophecies are speaking; we must know the modern identities of the peoples being referred to — in terms of today's world and in terms of the basic geography of the 1970's. Again, you need to study our free book, The United States and British Commonwealth in Prophecy, to find out. Fully one third of the entire Bible is prophecy — and about 90% of that one third is directly concerned with events in the coming decades, the '70's and '80's. Fourth, and finally, you must "WATCH." Christ said to watch in Luke 21:36 when discussing how we — those of us who are alive in the 1970's — can comprehend before hand the events leading up to the end of man's age and the beginning of God's Age. And ('watch" means watch world news. Read a major daily newspaper. Subscribe to a reputable weekly news magazine. Watch one of the three television network news programs. Begin to think actively. And creatively. Correlate what you have read in the Bible with the end result of the specific happenings of the day, week, month and year. Discern the underlying principle involved. Don't expect every event in March 1974, for example, to be mentioned in the Bible. But do expect the trends to be there. Carry these trends forward to their conclusions. And expect these conclusions to be in the Bible also. But a word of caution. Many conclusions and many trends ar not all that apparent to even the most astute geopolitical observer. There will be surprises — radical twists of events. The prophecies of the Bible are literally astounding. What might seem at the moment to be a logical conclusion to a given situation in world affairs can often be almost the opposite from what God has pre determined. Witness the Six-day War in June of 1967. Read The PLAIN TRUTH. Read our free book The United States and British Commonwealth in Prophecy. And, recall the third point in our logical system — the one for evaluating the prophecies fulfilled in the past. We had to conclusively prove that the various scriptures had significantly predated the historical event. We have no such point to prove with respect to the Bible prophecies (90%, remember) that will be and are being fulfilled in the 1970's and beyond. We have no need to counter any Bible critics. Everybody knows that the Bible was not written (or even edited) last year. And the events prophesied to occur have not yet occurred. Jesus Christ commissioned His Church to preach and publish the gospel of the Kingdom of God to all the world as a WITNESS (Matt. 28:18-20; Matt. 24:14; Mark 13:10). The Gospel is prophetic! It has to do with present-day world news, and the FUTURE of this whole earth! And Bible prophecy is really coming alive in these "searing seventies"! The world's "hot spots" are spreading and this decade promises to be one of the most traumatic in man's experience! You need to watch world events as they unfold, daily fulfilling the many intricate and specific prophecies relating to this pulsating twentieth century! 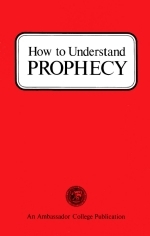 Yes, you need to come to UNDERSTAND prophecy! Only by understanding the prophecies of the Bible can you intelligently WATCH — and Jesus meant watch world news. When you KNOW, in advance, what is GOING to hap pen — then you can be a real watchman of Almighty God! But, realize there is also a spiritual ingredient involved in intelligently watching world news and correctly understanding Biblical prophecy. Let's understand what it is. God told Daniel the words which he had received were closed and sealed — but only UNTIL a certain time. Read it! "And he said, Go thy way, Daniel: for the words are closed up and sealed TILL the time of the end. Many shall be purified, and made white, and tried; but the wicked shall do wickedly: and none of the wicked shall under stand; but the WISE SHALL UNDERSTAND" (Dan. 12:9-10). Who are the "wise"? God says, "The fear of the Eternal is the BEGINNING of wisdom" (Prov. 9:10). Wisdom comes from God! "For the Eternal giveth wisdom: out of his mouth cometh knowledge and understanding" (Prov. 2:6). The mere BEGINNING of wisdom is to fear God. Next, one must learn to respect, to fear, to TREMBLE before the divinely inspired word of Almighty God! Today people say, "Well, I know the Bible says that -but here's the way I look at it!" People do not seem to really fear to misapply, to misinterpret, wrest, distort and twist the sacred word of God! People do not really RESPECT the divinely inspired words of Almighty God! That's why many people don't understand the Bible! You can come to understand the Bible, and Biblical prophecy, ONLY when you begin to really FEAR and RESPECT what the Bible says! The Apostle Paul said, "The natural man receiveth not the things of the Spirit of God: for they are foolishness unto him: NEITHER CAN HE KNOW THEM, because they are spiritually discerned (I Cor. 2:14). The disciples of Jesus Christ couldn't even understand the simplest parables which Jesus taught them privately! However, AFTER they had been converted, after they had received the Holy Spirit of God, then they UNDERSTOOD! It is only when one has been truly converted, has come to fear God, to OBEY God, has REPENTED, and received God's Holy Spirit, that true understanding of the prophecies of God can come. (Read our free booklet What Is a Real Christian?) So, STUDY YOUR BIBLE — PRAY for God to give you an obedient, humble, submissive mind — giving you more and more a deep, respectful AWE of the Word of God! You can't afford NOT to — your very life — your FUTURE is at stake!